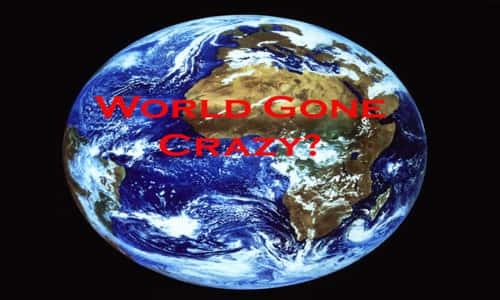 Did you ever wake up and look at the latest news and find yourself wondering, "Has the whole world gone mad?" It takes a lot to get me to that point. I see a lot of strange stuff here on the front lines of the culture wars. But every so often the accumulation of crazy stories strikes a nerve, making me ask myself, "Have we totally lost our minds?" It started again for me a few days back when I saw this now infamous tweet from a Planned Parenthood affiliate in Kentucky, declaring, "Some men have a uterus." Some men have a uterus. What on earth were they saying? Simply that there are biological females who now identify as men, because of which "some men have a uterus." This would be in keeping with the push to include tampons in men's bathrooms on college campuses, since "some men menstruate." What insanity! Now, just these stories alone would be enough to make one think that the whole world went crazy overnight, but these were just some of the stories that came to my attention in a matter of minutes (with some following a few days later). Over on our YouTube channel, someone named Jesus Ruiz took exception to my video asking the question, "Should Drag Queens Be Reading to Your Toddlers in Libraries?" I'm a devoted Christian, I read God's word. I see no problem with a drag queen reading to a toddler? When did God ever say someone in a costume is a threat? I think we should focus on bigger issues. If the Lord is my Shepard I'm pretty sure he's not leading me towards ignorance and hate? Patience and Love is the shop I'm on. Won't you join me? Yes, you read that correctly. A "devoted Christian" has no problem with drag queens reading stories to toddlers. And if you have a problem with it, it's because of "ignorance and hate." Did I say yet that I'm not making this up? That this was not all part of a bad dream? Back in the U.K., another headline declared, "University of Bristol students vote to ban 'transphobic feminist speakers.'" University of Bristol students have voted to no platform trans exclusionary radical feminists (TERFs) from speaking on campus. TERF is an acronym for Trans-Exclusionary Radical Feminist, who claim that trans women are not women and argue that they have male privilege. So, famous feminists like Germaine Greer and Linda Bellos would likely be banned from campus for being "trans exclusionary." How dare they argue that a biological male who later "transitions" to female is not a real female, or, at the least, cannot relate to the lifelong experiences of a female? What a bigoted transphobic point of view! And it is other feminists who are pushing the ban. I can only shake my head in amazement as the radical left continues to devour itself. Yet there's more still more evidence that the world has gone looney. Also from the U.K. comes this shocking headline: "Award-winning comedian accuses Cancer Research of 'fat-shaming' for launching campaign against obesity." Sofie Hagen, a Danish-born comedian who has lived in the UK since 2012 and appeared on the BBC multiple times, tweeted a picture of the poster, which spells out "OBESITY" with some missing letters, and asks readers to guess what the biggest cause of cancer is, after smoking. It's one thing to shame and belittle people for being overweight. It's another thing to deny the health risks of obesity and to criticize those like Cancer Research in their efforts to save lives. Speech is violence. Moderation is extremism. Fascism is antifascism. Racism is social justice. Welcome to 2018: where the truth is dead and words mean whatever you want them to. Yet there's more, and this from a totally different front, in a headline from the city of Chicago: "Proposed task force aims to curb shootings at funerals." This tragic story notes that, "Funeral services are supposed to be sacred. But it seems nothing will prevent gangs from opening fire on one another. "Cook County Sheriff Tom Dart convened a meeting Thursday of political, religious and funeral industry leaders to talk about the growing violence surrounding the funerals and processions of Chicago gang members." No doubt about it. The world around has gone totally crazy. But before you lose your mind too, allow me to give you a helpful perspective. Since the day Adam and Eve sinned in the garden, the world has been going crazy, to the point that their first son, Cain, murdered their second son, Abel. That's crazy. And it's not just America that's unhinged, but every nation on the planet, to one degree or another. In fact, one of our good friends, a missionary serving the poorest of the poor in Nigeria, sends me regular updates of the madness that surrounds her there. She closes her email with two words, which I will repeat here, pointing to the sole hope of our planet: "Only Jesus." To say it again: Only Jesus.